This Lunar New Year, yam seng with friends and family in the presence of two greats: Johnnie Walker and Glen Ord Distillery. Photo: Moët Hennessy Diageo Malaysia. On the bottle: Diageo, a heavyweight in the alcohol industry, may inform drinking culture in 180 countries, but only Malaysians enjoy immediate access to the Johnnie Walker Blue Label Pioneering Cities Limited Edition. Graphic designer RIon Wang did the honours of capturing the spirit of the festivities, and included iconography such as the hibiscus, mandarin oranges, the Petronas Twin Towers, the Kuala Lumpur Tower, and lion dancers prancing on stilts. 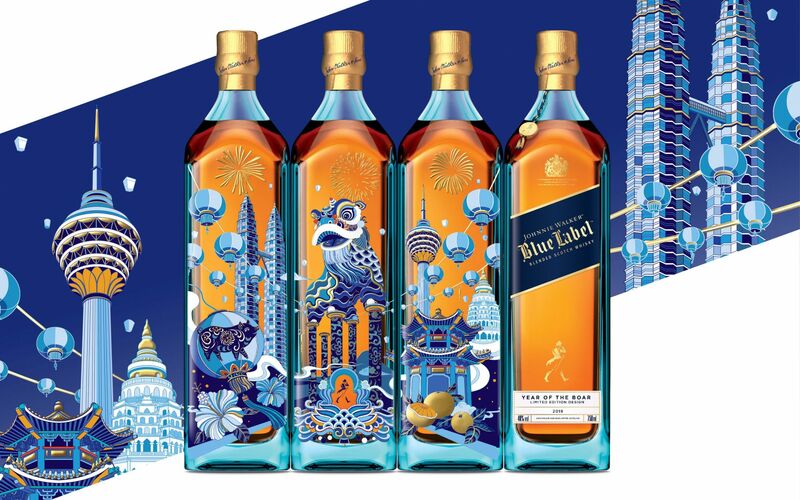 Inside the bottle: The pinnacle of Johnnie Walker's portfolio, the Blue Label is only broken out once in a blue moon—this time being the Lunar New Year. Dried lavender, leather and lemon peel are but a few aromas in this full-bodied whisky with a lingering finish. On the bottle: Coated in gold lacquer, this gorgeous square bottle intentionally resembles a gleaming gold bar. A complimentary surprise is included inside the cream box: a convenient flask for enjoying your liquid gold on the go. Inside the bottle: Synonymous with sweetness and smoothness, the Gold Label Reserve carries hints of vanilla, honey and caramel, making it a favourite among mixologists for whisky-based cocktails, though we like it just as it is. On the bottle: Worthy of tribute to the God of Wealth, this exclusive edition of John Walker & Sons takes cue from “Ru Yi” (如意), a Mandarin term meaning “everything goes well." Tapered sides give the bottle a masculine form that's indicative of the storm brewing within. Inside the bottle: Paying homage to Master Blender Alexander Walker II, John Walker & Sons XR 21 promises layers of citrus zest, ripe tropical fruit and smoky tobacco. On the bottle: Glen Ord, the last single malt scotch whisky distillery on the Scottish Highlands' Black Isle, has withstood the test of time for good reason. Its evergreen packaging is reflective of an eternal product. Inside the bottle: Slow distillation and maturation allows The Singleton of Glen Ord 12 Years Old to successfully strike a balance between lightness and complexity. Fans wax lyrical about the apple, prune and cinnamon aromas. Best served neat or with a judicious amount of water (one or two drops at most). Visit Stay Thirsty to add these exceptional whiskies to your personal collection or to gift them to friends, family and business associates.